Visit the turquoise waters of South George Beach on North Stradbroke Island (photo: Kara Roseland). If all the world’s shores were to converge on the stage like Miss Universe contestants, Queensland beaches would turn more heads than any other with its warm waters, 7400 kilometres of coastline – much of it surprisingly isolated – and sun-bleached lifestyle. Here’s some secrets you need to know. From Whitehaven Beach with its seven-kilometre strip of squeaky silica sand, so fine you can use it to polish your jewellery, to Snapper Rocks’ pro-surfer training ground, and Fraser Island’s infamous beach highway where 4WDs cruise the line between waves and dunes at 80 kilometres an hour, Queensland’s famous favourites are as well known in Biarritz as they are in Bendigo. But if you prefer throwing down your towel where the only footprints to be found are your own, there are plenty of beaches that fly under the radar but are just as swoon-worthy. From the NSW border to the pointy tip of Australia, we’ve uncovered our favourite lesser-known beauties. 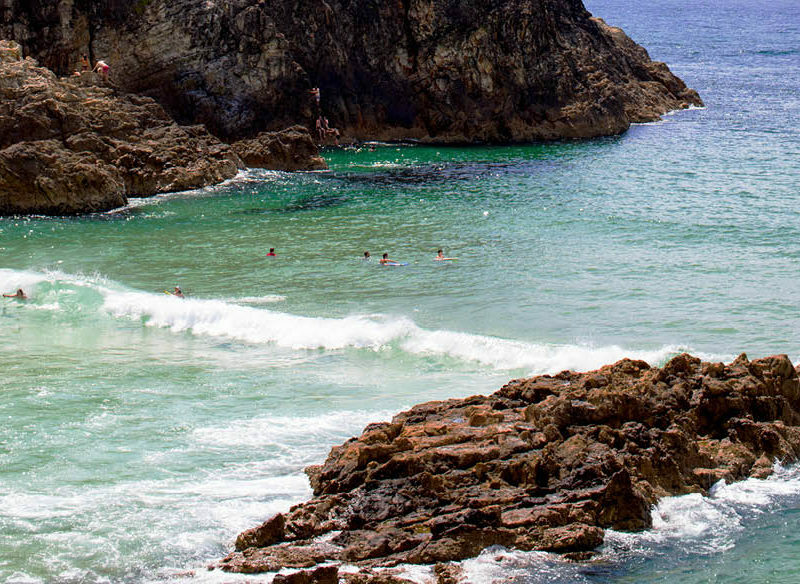 Winch Cove, just short of ‘A-Bay’, is a gem among the many sparklers that Noosa National Park boasts. While surfers come for the challenging point breaks at Granite Bay (the Granites to those in the know), Winch Bay is a little more under the radar. There are no flags here, which keeps the crowds that flock to the Sunshine Coast at bay, but there’s lots of dramatic scenery and space to indulge in. 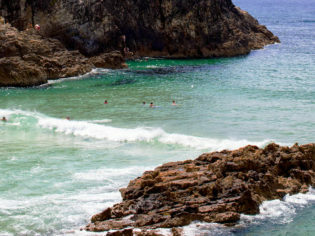 Beautiful Winch Cove Beach on the Sunshine Coast (photo: Tourism and Events Queensland). It’s hard for anything to remain a secret anymore in the age of Google satellite view and drones but just two kilometres from Noosa lies a stretch of sand most don’t even know exists. You can access it via the cafe strip of Duke Street or if you want even more seclusion, park in one of the residential streets at the northern end of the suburb and take the stairs down to lay out your towel where locals prefer to chill. Looking up there’s nothing but pandanus and melaleuca hiding beach houses away from prying eyes. On a calm day it’s picture-perfect for swimming but being the northern end of the coast, you’ll want to pack your surfboard and your nerve if you prefer to capitalise on the swell. If there’s a southerly blowing, head up the hill for a calf-burning hike into the more protected Alexandria Bay (A-Bay) in Noosa National Park. But before you go thinking Sunshine Beach is all beauty and no substance, this ‘burb is packing serious culinary nous for when the hunger pains start rumbling in. As the sun begins its swan song, head to Sunshine Beach Surf Club, perched over the sand, for budget brews and chews or slip into ex-MasterChef contestant Matt Sinclair’s cheeky dining room and bar, Sum Yung Guys, for dragonfruit-infused gin and tom kha mussels. Like any reward worth receiving, this one takes a bit of work – a 1024-kilometre drive from Cairns to be exact – but Punsand Bay is the icing on the ‘pinch-me-is-this-real?’ cupcake that is the journey to the ‘Tip’ of Australia. Whether you BYO vehicle for a tag-a-long tour or leave the driving up to a boutique operator like Australian Adventure Treks and Tours, just make sure you’re here with your camp set up in time for sunset. Grab a schooner of the most northern tap beer in Australia from The Corrugation Bar and dig your toes into the sand to watch the sun melt around you at the pointy end of Queensland, with the Arafura Sea to your left and Coral Sea to your right. And considering the effort exerted to get all the way up here, why sample just one wonder when you arrive? Head to Pajinka Beach along the seemingly endless Pajinka Road (Punsand Bay Road snakes off this at a fork in the road) to experience another awe-inspiring sunset experience in last-person-on-Earth solitude. Just when you thought every grain of sand on the Gold Coast had been conquered, this unassuming stretch of beach in between Currumbin and Coolangatta pops up right under your nose. Tucked discreetly in between Palm Beach and Coolangatta, you’d normally drive right by Bilinga Beach as you arrive or jet off from the Gold Coast Airport. Bar a few holiday apartments and ’50s motels, Bilinga is 100 per cent a locals ’burb where the only way to be is barefoot. There’s not a lot here and that’s its beauty – just a seven-kilometre stretch of sand to walk along and a north-facing orientation, which means smaller and safer surf conditions than its Snapper Rocks neighbour. Keen photographers should go in the late afternoon when the sunset casts its sherbet-hued fairy dust over Surfers Paradise’s skyscraper silhouette in the distance. Everyone loves Noosa – just try to find a park in Hastings Street on any given weekend and you’ll realise it’s true. But while the beach resort’s sparkling natural assets and dining accolades are well deserved, a short drive away lies an arc of untouched sands where the waves are even better, you can camp right behind the dunes, and the coloured sands of Rainbow Beach are within easy reach. Double Island Point on Noosa’s North Shore is reached via a comically short car ferry ride at Tewantin before you take the (tyre) pressure down and motor along Teewah Beach to find your perfect patch. Yes, you’ll need a 4WD but you can hire one in Noosa (or Brisbane) if you don’t have access to one and be schooled within an hour or so. If you’ve never been to Magnetic Island before, stumbling upon this blessed granite outcrop just eight kilometres off the coast of Townsville – smothered in national park and surrounded by fringing coral reef – will feel a little like how Captain Cook must have felt when he found himself caught in its spell. Convinced the islet was wreaking havoc on his compass, he bestowed the name Magnetic Island and it’s stuck ever since, though these days the magnetism is more about its 300 days of sunshine it sees per year and the fact it stays off the radar of even most Australians. Radical bay at it’s most stunning (photo: Tourism and Events Queensland). There are plenty of beaches to choose from on ‘Maggie’ – patrolled stretches, ones with water sports, others with dive sites, but the only way to reach Radical Bay is powered by your own two feet or your own boat. Pack a picnic and your snorkel (and some emergency toilet paper) for this off-the-grid watery wonderland. Radical’s sweeping bay, cradled by hoop pine and behemoth granite boulders worn smooth by eons of shifting tides, is reached via a 3.4-kilometre return hike from the main hub of Horseshoe Bay. Just don’t tell too many people where you’re going. There’s only one road in and one road out and this 16-kilometre strip of sand is protected on both sides by national park. In Woodgate, crowds are an urban legend and waves are as foreign as wool coats. Here it’s all about long lazy laps along the shoreline, stand-up paddle-boarding while keeping look for turtles below; or sharing the sand with curious wallabies who pop out of the bushland occasionally on the southern end. The best way to experience this sleepy seaside locale, 35 kilometres south of Bundaberg, is by renting an old school beach shack or booking into the beachfront caravan park. Fish and chips, afternoon ice-creams and naps under the casuarina trees that line the foreshore are par for the course, just like the holidays your grandparents used to take. When the whiting or the prawns are on you can bet there’ll be a couple of local salty sea dogs floating around in a tinnie, too. What could be more Australian? If you’ve been to Brisbane you’ll know that it’s biggest claim to fame in the beach stakes is its man-made beach at South Bank, overlooking the river that slithers its way through the city. Lesser known are its island neighbours. Within a couple of hours you can be paddling into the turquoise waters surrounding North Stradbroke Island, where whales, dolphins and turtles frolic just beyond the full, rolling waves. Protected from the onslaught of the swell that hits Main Beach on the other side of the surf club, this dreamy, narrow inlet is just a few metres walk away but surprisingly, most people who travel to Straddie don’t make it this far, settling in at family-friendly Cylinder Beach instead. After a day of alternating between the crystalline water and the North Gorge Walk, make like a local and grab yourself a scoop of Iced Vovo gelato from Oceanic Gelati & coffee bar at Point Lookout afterwards.